People are calling the Republicans' last-ditch effort to buy Senator Lisa Murkowski's vote for the healthcare bill the "Alaska Purchase". And that reference to the original purchase has us thinking about one of the undersung good guys in the country's history, William Seward. Seward was a New York Governor and Senator, Lincoln and Andrew Johnson's Secretary of State, and a staunch abolitionist. He used his home as a safe haven for runaway slaves as part of the Underground Railroad. And he was a good friend to Harriet Tubman, providing a house for her to settle in his hometown of Auburn, NY. This weekend, he would have been taking a knee. 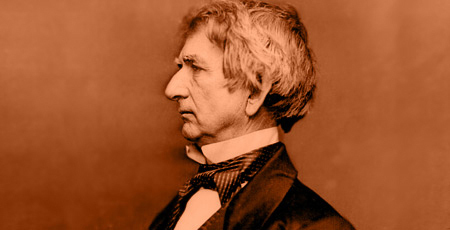 It was Seward, too, who advocated the purchase of Alaska from Russia. As you recall from your history classes, it was dubbed 'Seward's Folly' since it seemed like such a loopy idea at the time. Though he was a one-time rival of Lincoln's and, at first, no fan, Seward eventually became Lincoln's close friend and trusted adviser. In Madison Square Park, there's a statue of Seward by Randolph Rogers. It is said to be the first monument in the city honoring a public figure. The work is very similar to Rogers' earlier Lincoln sculpture in Philly's Fairmount Park—some say Madison Square Park has Lincoln's body with Seward's head. Seward Park is in the Lower East Side. You can visit his home in Auburn, now a museum. Details are here. And to learn more about Seward, you can't do better than Stephen G. Yanoff's biography, published in April, Turbulent Times: The Remarkable Life of William H. Seward.